Introducing the kind of pork chops you'd find on a brewpub's menu. 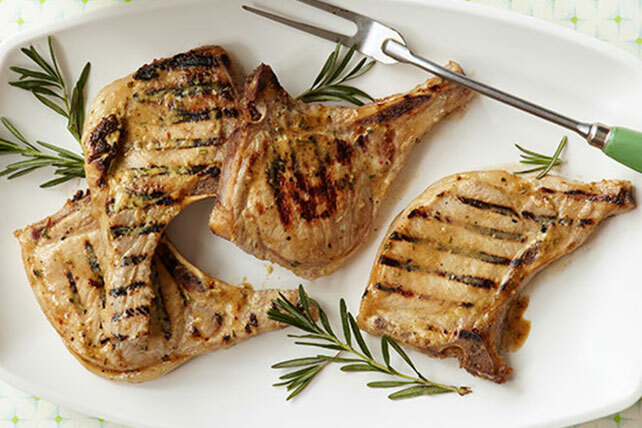 These beer-marinated chops with a mustard-garlic rub sizzle with big flavor. Mix first 4 ingredients until sugar is dissolved; pour over chops in shallow dish. Turn chops over to evenly coat both sides of each chop. Refrigerate 1 hour to marinate. Heat grill to medium-high heat. Remove chops from marinade; discard marinade. Grill chops 5 to 6 min. on each side or until done (160ºF), brushing occasionally with mayo mixture. Save 50 calories and 7 grams of fat per serving by preparing with KRAFT Mayo with Olive Oil Reduced Fat Mayonnaise. Prepare using GREY POUPON Savory Honey Mustard.